UK Airport Cars Ltd provides 24hr airport transfer services to/from all the airports in London as well as the major airports in England to any destination in the UK. UK Airport Cars Ltd is a license holder of Private Hire Operator provided by Transport for London's Public Carriage Office (PCO). We provide comfortable vehicles for transfers mainly to/from Airports, Seaports, Group Tours and Business visits to any destination within the UK. We operate 24 hours a day, 7 days a week, 365 days a year. Our chauffeurs are well trained and committed to friendly customer service, taking you to your destination in comfort and style. We monitor flight arrival times and there are no additional charges for flight delays or cancellations. Our chauffeurs will meet you at the arrival entrance area with a sign bearing your specified reference (Name). The waiting time of the airport pickup is 100% free of charge. UK Airport Cars Ltd provides 24hr airport transfer services to/from any London Airport (Heathrow, Gatwick, Luton, Stansted and City Airport etc.) and to any destination in the UK. We also handle transfers to/from Seaports, Group Tours and Business visits to any destination within the UK and Courier Services for delivery of parcels. 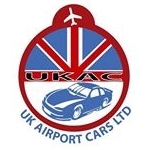 UK Airport Cars Limited is a registrar of companies for England and Wales. The company is a transport for London's Public Carriage Office (PCO) licensed Private Hire Operator. To fulfil customer requirements, we provide child seats (infant, child and booster) for safe transfer of your children. UK Airport Cars allows passengers to have a variety of payment methods, such as cash directly paid to the driver or the use of major Credit/Debit cards including Amex and PayPal (paid online). We are located in Greater London and have been in business in this field since 1996.